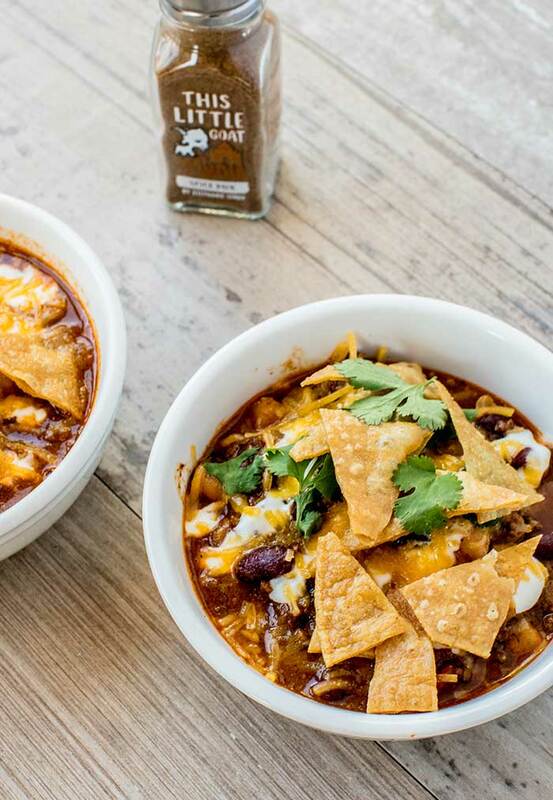 When we got ready to open little goat diner in the west loop in Chicago, I knew we needed a tasty chili with a fun spice profile. I have been to so many chili cook offs over the years and what I always enjoy is a spice that just comforts me and has the feeling of warmth! Not too spicy, just layers of flavor with a bit of spice! Sweat onions and garlic until softened. Add remaining ingredients, simmer for 30 minutes. Brown beef in a wide pot. Do not strain. Add onions, pineapple and apple. Sweat until tender. Add spice mix and mix unil thoroughly combined. Season with salt. Add chili base and canned tomatoes. Cook uncovered over medium-low heat for 2 hours, stirring regularly. Add beans and pickled peppers and taste for seasoning.